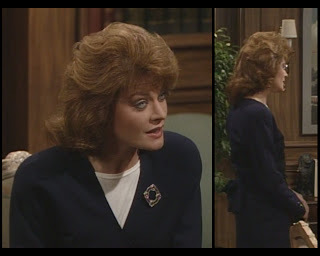 When Clair's old friend, a famous celebrity interviewer a la Barbara Walters, comes in for legal advice about a possible divorce, she ends up receiving marriage counseling. 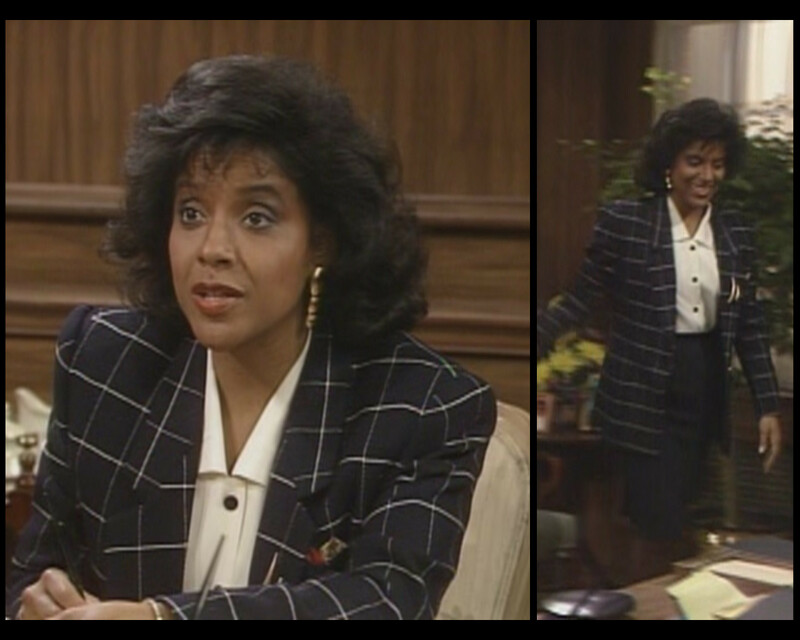 Ms. Huxtable is skilled in all areas of life and manages to reunite husband and wife with almost no effort. At home, Cliff is on a much-needed staycation while Vanessa tries to stump Theo with a series of riddles. Keeping with the show's favorite theme, her ultimate victory comes from a puzzle that plays on the listener's sexist assumptions. She looks like a supervillain. Friend or arch-nemesis? Clair's friend Dyan Hemmings is played by Meg Foster. Her biggest success was probably her leading role in They Live, though I was personally more familiar with her as Evil-Lyn in Masters of the Universe. You might also know her as the first Chris Cagney in Cagney & Lacey, though she was replaced by Sharon Gless after six episodes. She still works sporadically, for instance her recurring part as Hera in the Hercules/Xena universe. Breaking down her clothing choices is going to be difficult for me because I can't pull my gaze from the white-hot fury of her practically colorless eyes. This first presentation is simpler than I might have expected. As a television icon, she could no doubt afford high-end items, but instead sports a fairly standard navy wrap dress with what may as well be a white t-shirt beneath it. The brooch on her chest highlights the fact that she's wearing almost no jewelry. Not that she has to be ostentatious about her riches, but you'd think she'd present something a little more obviously fabulous. 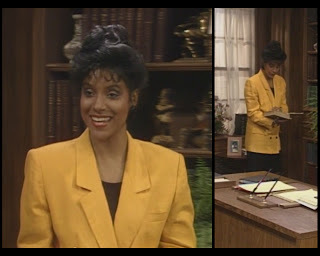 Her outfit on her second visit to Clair's office is slightly closer to what I'd imagined, though I suppose the difference between the character's fictional budget and the show's actual constraints preclude full runway realness. Not that her look here is some couture creation, but for the time, it's fairly fashion-forward . She's rocking high-waisted and pleated trousers, a billowing cowl-neck blouse, a thin braided belt, and a severely structured blazer that all scream of the power suit trends prevalent at the time. The polka dots add a hint of playfulness into the mix. You'd have trouble making most of this work today, but this is her decade's version of a suit of armor. He was expecting a white picket fence, not a lair full of minions. Depicting Richard, the doubting husband, is Joel Fabiani. 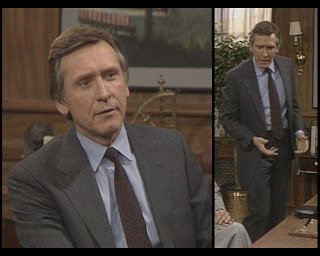 His resume's most prominent credits are long-standing characters in soap operas like Dynasty, As the World Turns, and All My Children. His look is a 100% standard suit. I have nothing much to say about it. You're going to continue working, don't worry. We learn this week that Clair has an assistant named Jo Ann. 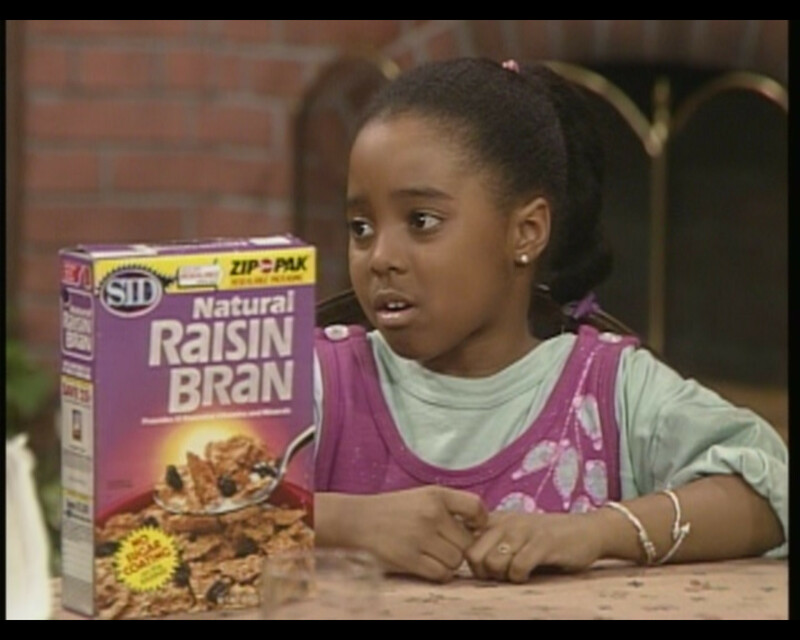 She's played by Jodi Long, who has a knack for landing big parts in shows that don't fare too well. After playing Margaret Cho's mom in All-American Girl and Judge Phelps in Eli Stone, let's keep our fingers crossed that Sullivan & Son sticks around for her. Though hindered by the decade's preference for wide cuts, she otherwise shows real promise in her selections. The minty shade of her blazer (with that spunky hint of white in the lapel) pairs perfectly with the warm brown of her plaid skirt. Her collarless blouse and lack of necklace keep the lines clean. If you took this to a tailor, it could become perfect. I'm glad she eventually cut some of this hair off. I know, Raisin Bran is so disappointing. The influence of The Golden Girls is felt even by the youngest generation, huh Rudy? You wanna have some cheesecake or hang out on the lanai? 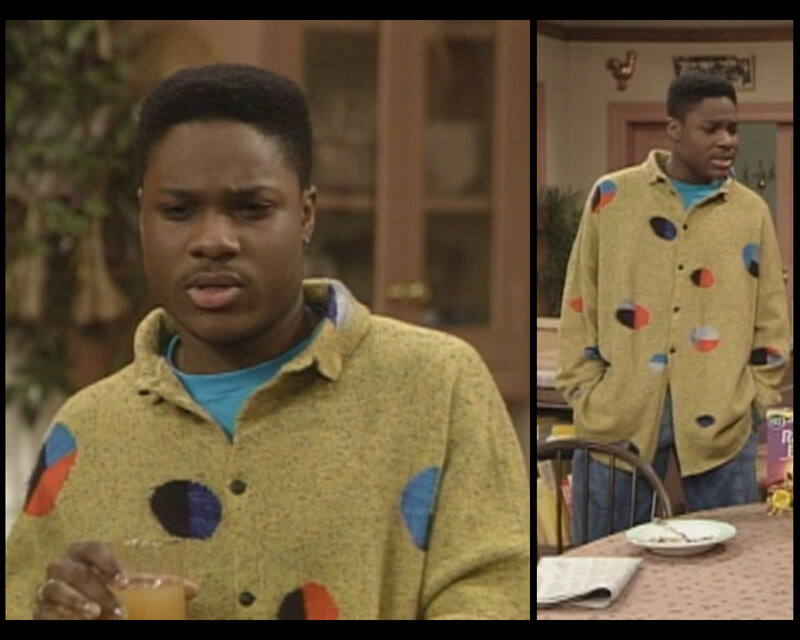 This sweatsuit is also disappointing. Those pinks don't match and nothing fits. Done. Don't drink and dress, kids. Vanessa's gone far too far with this creation. If I were to pick out a positive, I'd have to say that it was smart of her to stick to solid colors if she was going to choose structural embellishments like these. A double skirt over loose pants? A non-standard sleeve length with aggressively padded shoulders? A beaded belt? The last thing she needs is a print to addle things further. Nonetheless, her palette is garish and the overall effect is disorganized. I'm sure she thought about this before she put it on, but it still looks like her garments were selected randomly. Her second outfit is an episode #4.11 repeat, though she has added that confusing pin. It's a bow with seemingly random letters on it. Why? No idea. Theo's look (he only appears once this week) is also from #4.11, though he's opted for a simpler tee rather than a second collared shirt underneath the first. 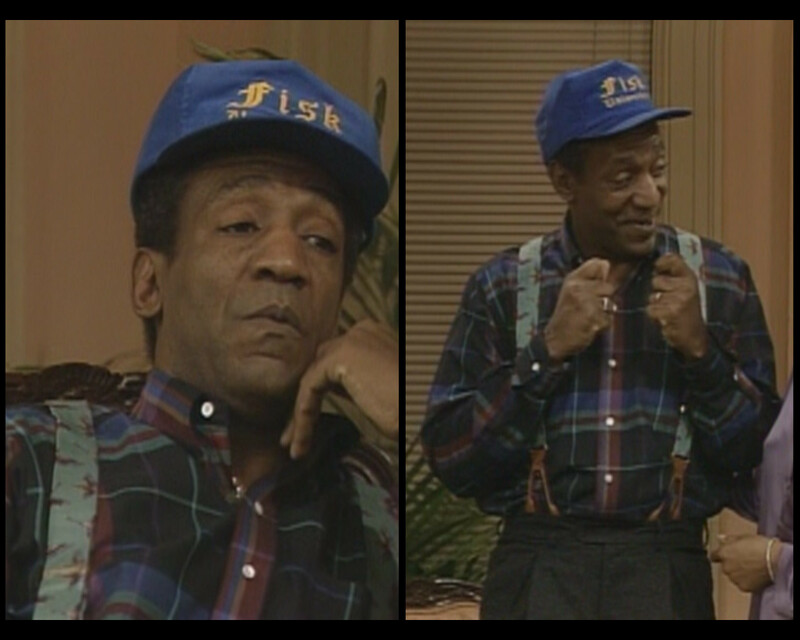 Clair gives us two new looks this week, both of them work outfits. Her first is all about that sunflower shade. While I of course disagree with the tailoring of her jacket, I otherwise think this is a smartly constructed presentation that allows the assertive hue to dominate without using other embellishments that would overcomplicate things. I'm confused by the complete lack of necklaces this week. Was it a deliberate choice? It doesn't work here because of the low-cut, casual-looking shirt. She needs either jewels or a collar to add some formality. Now we're talking! A big collar and a big pattern. This says work to me. My one problem is that the navy in her skirt is a hair off from the navy in her jacket. Just go with a different color! You have other skirts that would have worked here. 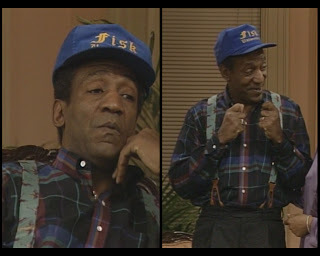 Cliff begins the episode in his episode #4.6 shirt, plus his suspenders with the birds on them. I'm into it. OK, this I have never, ever seen. But I'm even more into this. Like, the doctor knows how to relax when he's at home. He's crossed over from lazy into crazy. And that's that, gang. 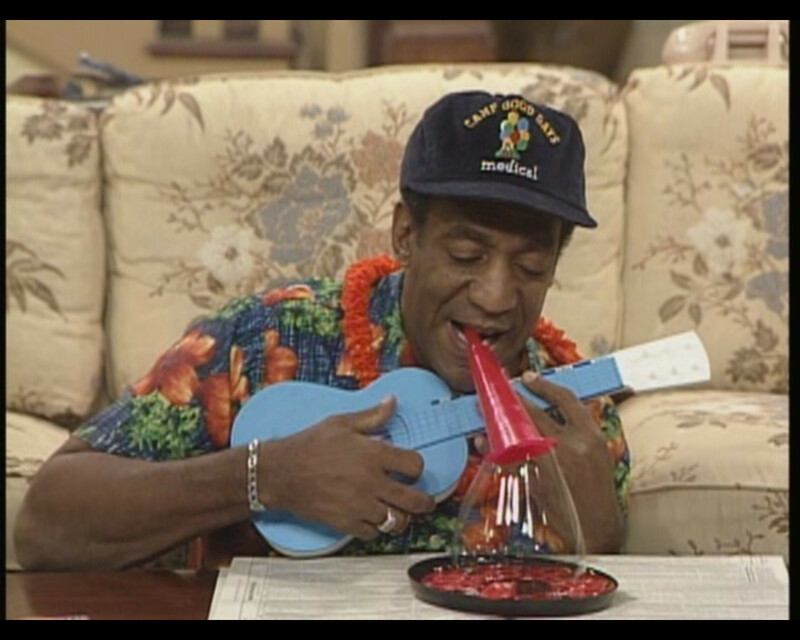 If this episode inspired you, I encourage you to take a day off work and stay at home acting like an utter lunatic. It's much more freeing than simply lounging around. I recently discovered this blog, and I adore it. Thank you for the work that you do! 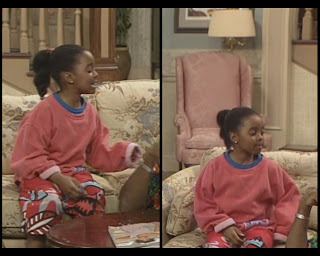 I never realized just how little of Clair's natural stylishness was passed down to Vanessa and Rudy. 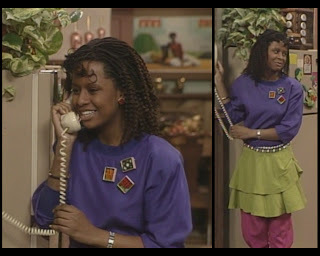 I guess Denise got it all, or the show's costumer just really hated Tempestt and Keshia.